Spring is finally here, and summer is just around the corner. We finally get rid of the fine dusting of yellow pollen that covers everything in sight, and I can already feel the humidity closing in! Those 90 degree, “I don’t want to even step outside to walk to the mailbox” days are almost here. But this time of year isn’t all bad. With May comes graduations (yay, Duke DPT Class of 2015!) and getting letters after your name (I just passed my boards exam and am officially “Claire McCormick, PT”!) as well as family vacations, get-togethers with freinds, and COOK-OUTS! Tonight Ben and I are going to our first cookout of the season, hosted by a couple in our small group. 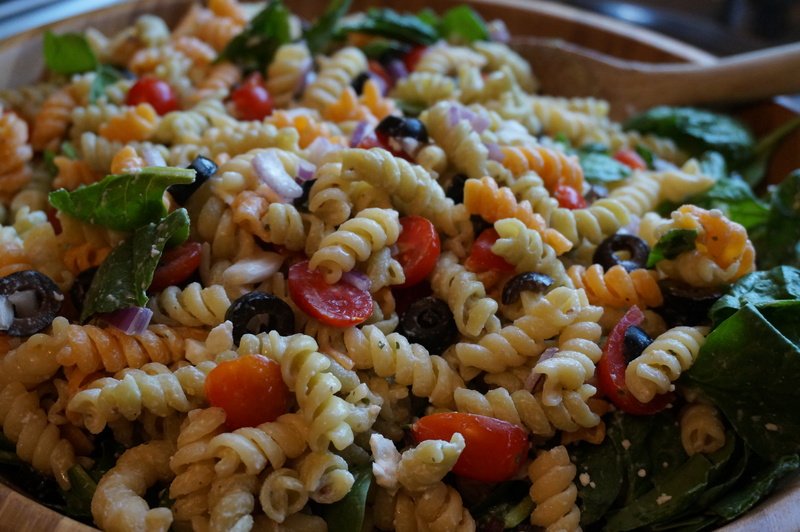 When trying to decide what to bring along, I thought it might be a good way to kick off the cook-out season with a summery pasta salad. I used tri-color rotini and a dressing using Greek yogurt in place of mayo, combined with a generous sprinkling of Ranch dressing seasoning mix. 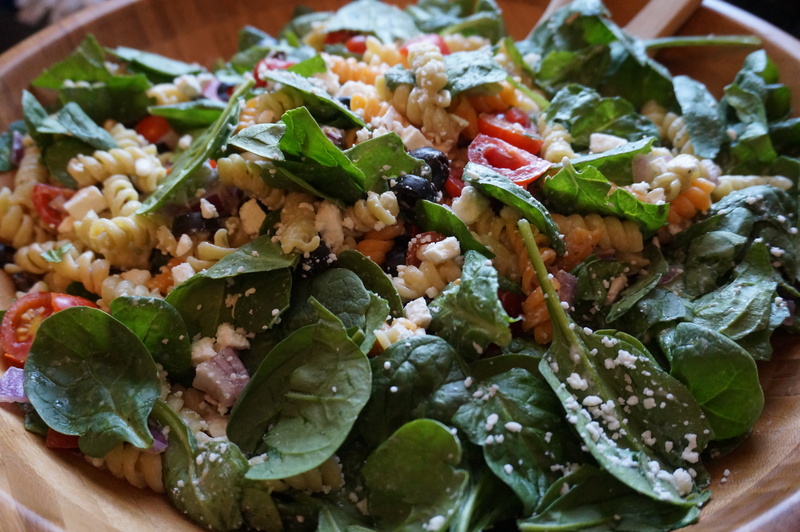 Tossed in some chopped red onion, tomatoes, and olives, and served it over spinach greens with some feta cheese on top. Hopefully it will be a hit! Happy graduation, Dukies, and Happy Mothers’ Day, to all you mothers out there! 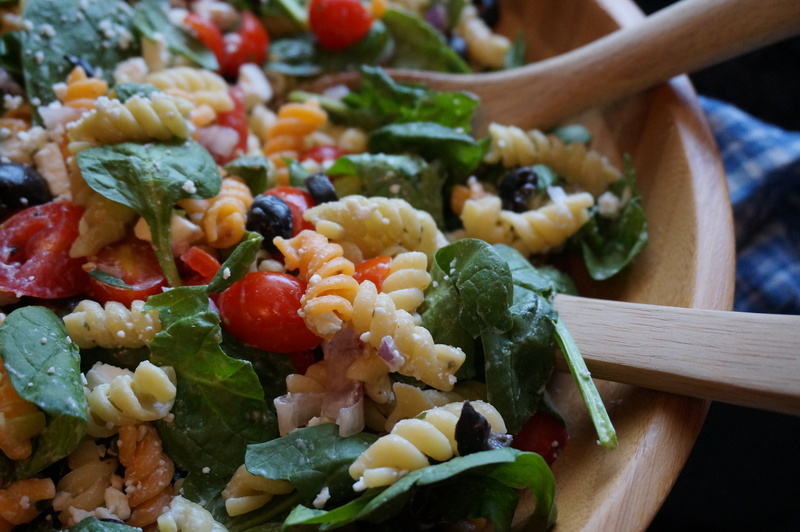 Get ready to kick off the cookout and BBQ season with this easy pasta salad! Cook pasta according to package directions, until al dente. Drain and cool. Toss pasta with chopped veggies in a large bowl. Whisk together remaining ingredients for the dressing and pour over salad. Toss well until combined. Top with feta and chill up to a day in advance.